The Minnesota Lions Vision Foundation, Inc., was incorporated more than fifty years ago as “Minnesota Lions Eye Bank.” Two organizations—the University of Minnesota and the Lions—were instrumental in the creation of this Minnesota icon when they both recognized the need for an eye bank in their state. Dr. Harris, chair of the Department of Ophthalmology, laid the groundwork for an eye bank by developing a plan to approach the families of deceased patients at University of Minnesota-affiliated hospitals about donating their loved ones’ eyes. He then worked with the School of Mortuary Science to establish a mutually acceptable technique for removing donor eyes. Austin, Minn., Lions club member, George Dugan, solicited Lions club support across the state and arranged financial backing. Thanks to Mr. Dugan’s efforts, Minnesota Lions, at their annual meeting in June 1960, unanimously adopted the eye bank resolution, and the Minnesota Lions Eye Bank was born. In the spring of 1961, Minnesota Lions presented the University with a check for $6,400, representing a pledge of $1.00 per Lions member. The Lions contributions increased regularly as the eye bank program expanded, and today Lions donations top $200,000 per year. The Lions of Minnesota provided more than must financial support to the eye bank. They also solicited public support for the eye bank by instituting a donor card system. 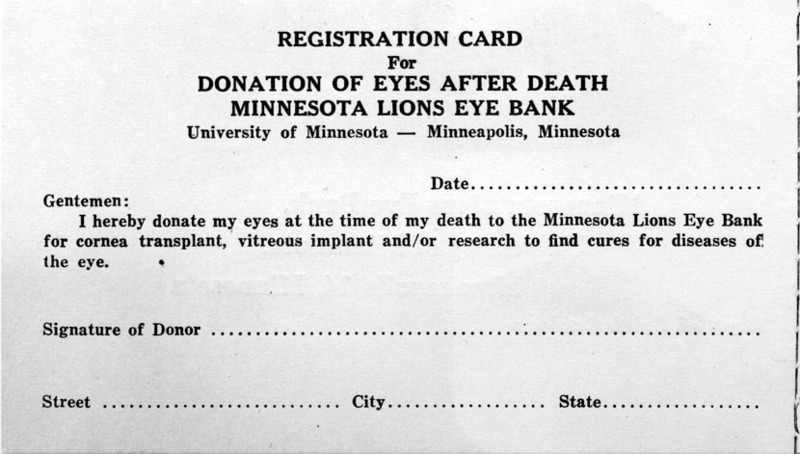 By the early 1970’s, thanks to the outreach of local Lions clubs, approximately 100,000 Minnesotans carried donor cards asking that their eyes be donated to the Minnesota Lions Eye Bank after death. 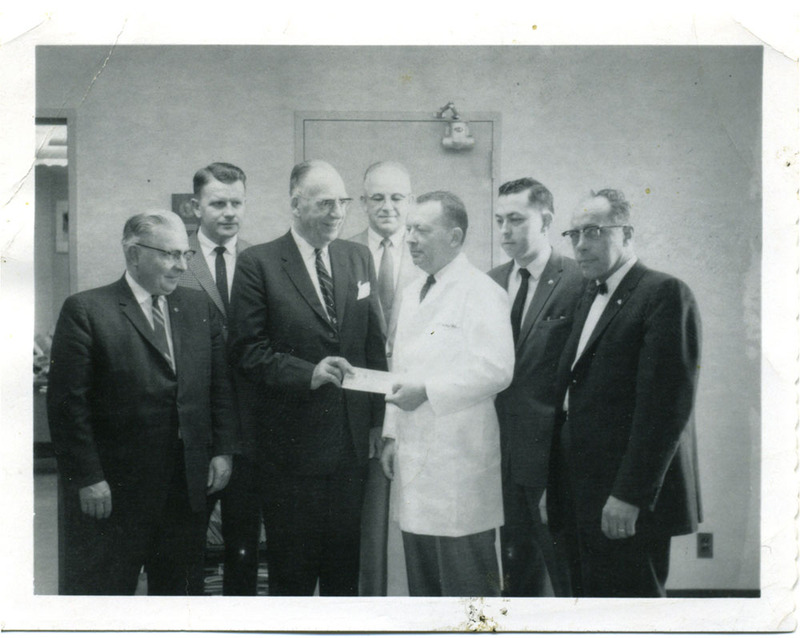 Minnesota Lions Eye Bank Board of Directors presents Dr. Harris with the Lions’ first financial contribution on March 17, 1961. Minnesota’s first donation registry was administered by the eye bank. Early eye exam of child at Lions Children’s Eye Clinic. Eye bank technicians (Kathy Goode, M.A., pictured) partner with U of M scientists on many eye research projects. Until the Minnesota Lions Eye Surgery Center is built, some ophthalmology surgeries will take place in the new University of Minnesota Health Clinics and Surgery Center on Fulton Street. Minnesota Lions Eye Bank, Inc., soon branched out to support more than just the eye bank itself. By the mid-1960’s, the board of directors of the approached the University of Minnesota for an additional project. The answer was the Lions Children’s Eye Clinic, the second U-Lions partnership and the beginning of what is collectively called the Lions Sight Program. More collaborations followed. 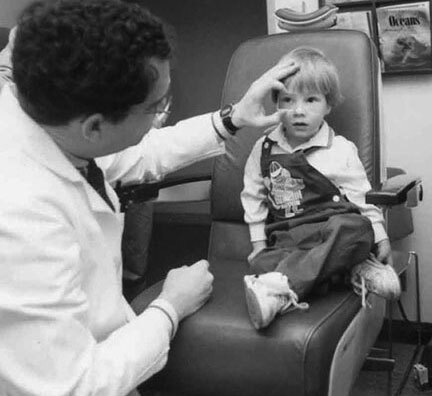 The Lions Children’s Eye Clinic, which opened in 1978, is the leading clinic in the upper Midwest for the treatment of children’s eye problems. Four dedicated pediatric ophthalmologists from the University of Minnesota Pediatric Ophthalmology and Strabismus service treat more than 8,000 patients each year, assisting children as young as a few days old. The clinic is the second largest and best-staffed clinic of its kind in the country. More than 8,000 children are seen in the clinic each year. Over the years, the Lions have funded extensive remodeling, and they regularly donate money for needed equipment. 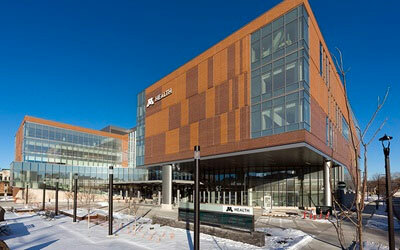 In 1993 the Lions Research Building opened on the University of Minnesota’s Minneapolis campus. 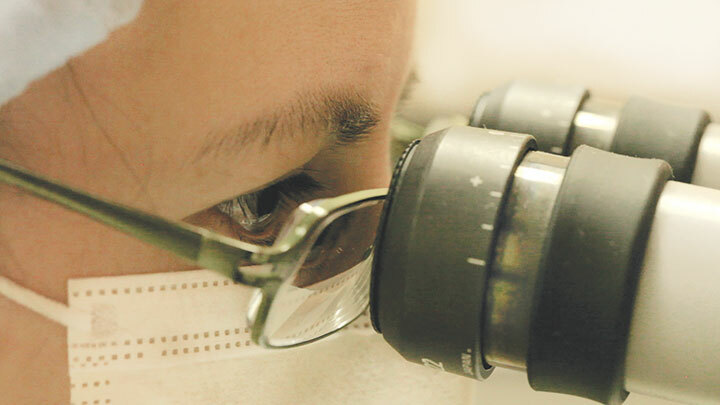 The state-of-the-art laboratory building houses investigators working with the departments of ophthalmology, otolaryngology, and neurology, and collaboration among these departments is important to many research projects. The Lions of Minnesota made a gift of three million dollars to begin the project and continue to support ophthalmology research. 1998 saw another tremendous effort by the Lions of Minnesota when they pledged 2.5 million to the Minnesota Lions Macular Degeneration Research and Rehabilitation Center (The MAC). The MAC gathered together the physicians, researchers, the medical technology industry, and the Lions to fight the leading cause of blindness in the developed world and find a cure for macular degeneration. In 2012, thanks to a Lions Clubs International Foundation matching grant, the Lions of Minnesota established the Lions Advanced Retinal Imaging Center. The center houses a Heidelberg Engineering Dual Wavelength Spectralis, an amazing piece of equipment that takes diagnostic images of the back of the eye and has the ability to create specialized photos and cross-section scans of the retina simultaneously. This capability allows physicians to follow the progression of a patient’s retinal disease with both qualitative descriptions and exact quantitative measurements. Minnesota Lions Vision Foundation reinforced their long-standing support for the University of Minnesota’s Department of Ophthalmology in 2015 by pledging $4 million to fund a specialty surgical suite, the Minnesota Lions Eye Surgery Center. With the aging of our population, demand for the services of eye surgeons will increase more than 33% in the next five years! The Minnesota Lions Eye Surgery Center will create critical surgical space for cataract and other eye surgeries.